Nom, nom nom. Nothing like food you can really sink your teeth into to satisfy. My latest colorful creation has plenty for you to chew on! 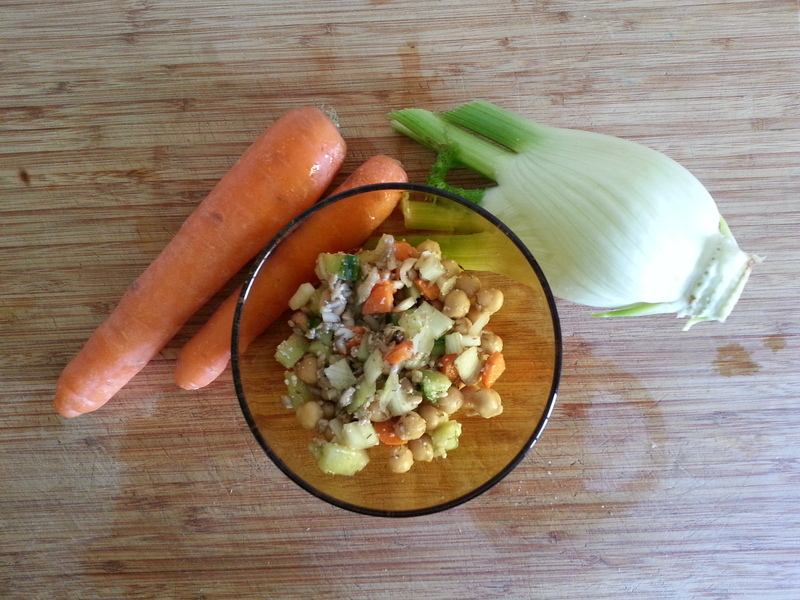 Fresh fennel, crunchy sunflower seeds, snappy cucumber, and crisp carrot blend nicely with the flavors of nutty chickpeas and dill. What I prepared fed me and hubby. But don’t sweat the amounts. Use your eye and trust your gut. That’s part of the fun. Chop a spring onion or two. Slice and then dice some fresh fennel. Place the veggies in a mixing bowl and shower with the juice of half a lemon. Rinse canned chickpeas, dry and add to bowl. Add dill, salt, and pepper to taste. Add a nice sprinkling of sunflower seeds. You can also add a dash of balsamic vinegar. Finish off with some parmesean cheese. This recipe is wide open for options. Can’t find fennel? Substitute celery instead. No sunflower seeds on hand? How about some chopped almonds? No parmesean left after last night’s pasta? Feta will do. You get the idea.